The incarnation of God the Son was and is essential for our salvation. not so that God might gain an understand of us — not just to walk a mile in our shoes, as it were. not primarily to be an example for us so that we might simply do as he did. bring us to life by his resurrection. Only a person who is both God and man could do this for sinners. Now, there is an alleged difficulty with the text. A few ancient Greek manuscripts read ‘who was manifest in the flesh’ and a few others read ‘which was manifest in the flesh’. I argue that the true reading is not ‘who’, not ‘which’, but ‘God’. The word ‘mystery’ is neuter in gender while “godliness” is feminine, but “who” is masculine! The pronoun must agree with its antecedent. It is bad grammar to accept ‘who’ in this place. That is why people who think ‘who’ is the correct reading very rarely translate it as who, but rather as ‘He’. That is, the word ‘who’ does not make sense in context in either Greek or English. How might these readings be explained? The word ‘God’, in ancient Greek, could be abbreviated as ΘC. A line was drawn above these letters to indicate the abbreviation. The relative pronoun ‘who’ was written as OC, and ‘which’ in Greek was written O (see below). 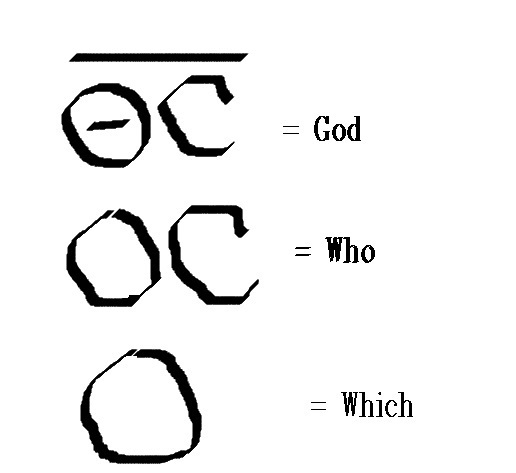 Note that the only graphical difference between ‘god’ and ‘who’ are a short line within an O to make a Θ, and a longer line above to indicate the abbreviation. It is likely that these two lines faded over time due to continual use, and finally looked as if it had been written as OC instead of ΘC. Thus ‘who’ replaced ‘God’ in subsequent copies. The reading ‘which’ O, is a likely scribal correction of OC to something that made grammatical sense in context. Nevertheless, 98.5% of Greek manuscripts (all available manuscripts are copies) say “God”, and the reading ‘God’ is older than the surviving Greek manuscripts that contain it as the reading appears in the works of some early Christian writers. Now, orthodox people who think the reading is ‘who’, often say that the ‘who’ refers to Christ. Seems ok, but if the true reading were really ‘who’ and the reference is to Christ, then Jehovah Witnesses, Gnostics, Arians, Unitarians, all could agree. The problem is that they will only accept a Christ who is not really God and man in one person. The assumed reference to Christ is no remedy against untruth. The mere man Aaron was a ‘Christ’ as was every high priest, because they were anointed (= Christ in Greek) with oil when they were made priest. The mere man King David was a Christ, as every king of Israel was a Christ because they too were anointed with oil . Simply saying ‘Christ’ is the word referred to by ‘who’ is not true to the context. Even Trinitarians who accept the ‘who’ reading, stick to Christ as the one referred to by ‘who’, because, I suspect, they are ashamed to reject ‘God’ as the correct reading, yet say ‘God’ is the antecedent of ‘who’. But above all the great mystery revealed IS that the God became a human being for our salvation. 2 Corinthians 5:19-20 (God was in Christ reconciling the world to himself). A mere man, even a good mere man could not save (see Ps 49:7 and Ezek 14:4 & 20). Yet God cannot die, and our Saviour had to die as our substitute in order to deal finally with our sin. So, our saviour must be man as well (Matt 1:21, Luke 2:11). There is no mystery in a mere man appearing in the flesh, that is why Paul did write: God was manifest in the flesh. This entry was posted in Uncategorized and tagged 1 Timothy 3:16, Gnotics, God was manifest in the flesh, Jehovah Witnesses, unitarians. Bookmark the permalink.